A pelvic peritoneal pocket in association with endometriosis was first described by Sampson . Chatman , and Chatman and Zbella  illuminated more clearly the positive relationship between those structures and endometriosis. From their observations it is clear that endometriosis within such defects may remain hidden and therefore undiagnosed. A group of cases of peritoneal pockets among patients with endometriosis confirmed a positive relationship and permitted further observations on the character and possible origin of such peritoneal structural abnormalities. Among 132 previously  patients with a diagnosis of endometriosis made at laparoscopy or laparotomy, the presence or absence of peritoneal pockets was noted. When necessary, eversion was performed to investigate for subtle peritoneal changes suggestive of endometriosis. If the diagnosis was in doubt, the everted peritoneum was excised to provide biopsy confirmation of the disease. Observations on the characteristics of the defects were noted in the operative report, as was the occurrence of endometriosis around the mouth or inside. One patient had three pockets, while three patients had two each. Almost one-fifth of the patients studied had the structures, and two-thirds of the pockets had endometriosis either inside or around the mouth (Table 1). *Endometriosis either within the pocket or around the mouth. The pockets in this study ranged from < 1 cm in diameter at the mouth to almost 2 cm. Others identified since the study had mouths up to 3 cm across. Several were quite deep, reaching almost to the sacrum lateral to the left uterosacral ligament. One of them was branched, with three small side chambers. Deep or branched pockets were not observed lateral to the right uterosacral ligament. Since this study, very shallow pits have been observed in the cul-de-sac; they were < 0.5 cm deep. Occasionally a partial pocket was represented by a fold of peritoneum forming an arc across the cul-de-sac or pelvic sidewall. The pockets in this study were not attached to underlying vital structures since all could be everted completely by grasping the peritoneum at the bottom and pulling up. The mouths of the structures were occasionally difficult to see. When the mouths were collapsed, only a thin line was visible, and it blended with the peritoneal folds. The mouths would open only when the uterus was drawn forward. The endometriosis encountered around the mouths or within the pockets was rarely black, thus emphasizing the need for biopsy confirmation of subtle peritoneal changes . 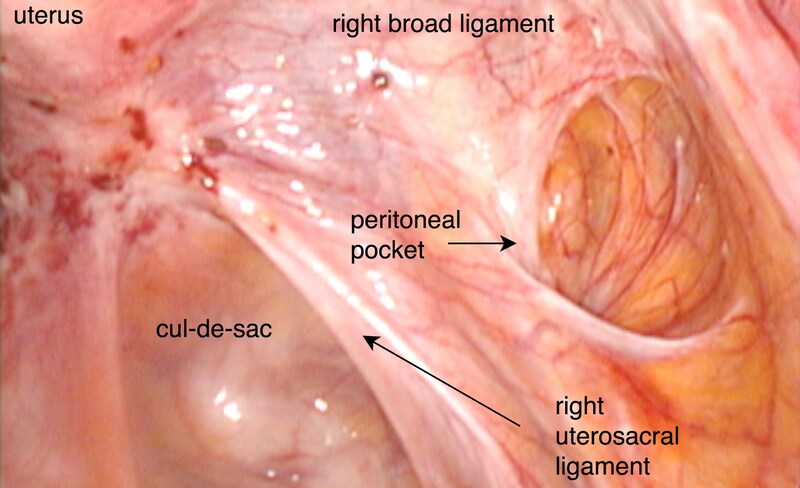 This annotated photo taken during laparoscopy demonstrates the presence of a peritoneal pocket in a patient with endometriosis. Since this study, pockets have been encountered with mouths covered by a thin membrane of peritoneum with only a small hole showing. Bloody fluid bubbling up through the hole may be the only evidence of the underlying structure. Although artificial pockets have been observed that seemed to result from scarring and stellate retraction of peritoneum surrounding a nodule of endometriosis, such retraction pockets were not the subject of this study. This study confirmed the association of endometriosis with peritoneal pockets, as described previously [2, 3]. They are occasionally difficult to see, and unrecognized disease within is a potential cause of misdiagnosis. The endometriosis associated with the pockets is quite subtle, and it is therefore advisable to evert the bottom of the pocket for inspection if it cannot be seen readily. All pockets that were excised in this series had an underlying layer of areolar tissue, which facilitated their easy and safe removal at operative laparoscopy or laparotomy. If a pocket cannot be everted, it would be unwise to cauterize its base blindly since endometriosis at the base could be attached to the sciatic nerve [6, 7]. The origin of these structures has been postulated to result from peritoneal irritation or invasion by endometriosis, with resultant scarring and retraction of peritoneum [2, 3]. In this series, however, no significant fibrosis was found in or around any pocket, and not all were associated with endometriosis. The existence of endometriosis within a pocket has been postulated to result from preferential implantation of regurgitant endometrium , but another postulate exists. Since not all the pockets had endometriosis and fibrosis was not seen in this series, those peritoneal defects do not seem to be secondary to identifiable local peritoneal factors, such as scarring and retraction from endometriosis. It seems more likely that they represent a primary developmental formation defect of the pelvic peritoneum. Also, since one-third lacked endometriosis in this series, they do not appear to necessarily attract and nurture regurgitant endometrium, especially when one considers that the endometriosis associated with a pocket was occasionally found just around the mouth. It is therefore possible that endometriosis and these peritoneal invaginations simply are ontologically related. The adult posterior pelvic peritoneum-to-be occupies the same territory as does the differentiating and migrating müllerian duct system [8, 9]. Whatever force operated to form the pockets may coexist frequently with another force that causes a developmental abnormality of differentiation or migration of the cellular components of the müllerian duct, resulting in disease in some, but not all pockets. Peritoneal pockets were found in 18% of women with endometriosis in this series and are important in the management of the disease since failure to identify them or endometriosis within them will result in underdiagnosis of the disease. In patients with endometriosis and peritoneal pockets, two-thirds of the structures had endometriosis either around the rim or inside. Peritoneal pockets may be ontologically related to endometriosis. This postulate would be strengthened if one found a decreased frequency of the structures in patients without endometriosis.